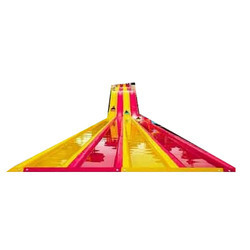 Offering you a complete choice of products which include frp water pedal bike, frp water pedal cycle, frp water slide, water pedaling cycle, frp tricycle water bike and frp water amusement rides. Our firm has been continuous gaining appreciation as the prime organization offering of Water Pedal Cycle. 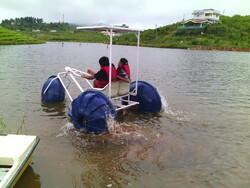 The provided pedal cycle is seen used in amusement parks, hotels, and on the river bed counting sea. This pedal cycle has been developed by expert professionals using quality FRP and stainless steel materials and latest techniques at our vendor’s end. Our professionals ensuring that the pedal cycle is built adhering to industry norms. In addition, clients can get the pedal cycle from us at industry leading rates. FRP Water Slide offered comes in light yet durable finish as well as in different color choices. Bestowed with an ingenious team of designers and advanced production unit, we have been able to introduce an exclusive range of Water Pedaling Cycle. These rides have been built by expert professionals using quality FRP and stainless steel materials and latest techniques. Engineers at vendor’s professionals in accordance to set industry quality norms built the rides using approved process and high grade materials. Also, clients can get the rides from us at affordable prices. Bestowed with an ingenious team of designers and advanced production unit, we have been able to introduce an exclusive range of Water Amusement Rides. These rides have been built by expert professionals using quality FRP and stainless steel materials and latest techniques. Engineers at vendor’s professionals in accordance to set industry quality norms built the rides using approved process and high grade materials. Also, clients can get the rides from us at affordable prices. 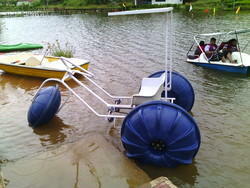 Three Wheel Water Bike offered comes 9in attractively and sturdy construction finish. Fiberglass water bike offered comprises highly exciting and durable option of water bike. To meet the diversified requirements of our prestigious clients, we are engaged in offering FRP Sports Vessels. The offered vessels are developed using quality tested FRP and stainless steel materials with the help of contemporary techniques at our vendor’s well-equipped production unit. 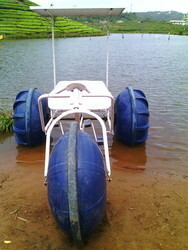 For enjoying water sports, these vessels are widely used in several industries. Further, our client can easily avail the offered vessels at economical price range from us within promised time frame. Light in weight and easy to handle and instal.